Do you know the difference between a cryptogamist and a cryptogramist? The MoD certainly didn't, at least not during World War II, and that's why it recruited former Museum scientist Geoffrey Tandy to work at Bletchley Park. You see, a cryptogamist is an expert in non-flowering, spore-reproducing plants like seaweeds, mosses and ferns. That's what Tandy was. He worked at the Museum from 1926 until 1939 and was the first member of staff to specialise in algae. However the MoD got his speciality confused with a cryptogramist, someone who deciphers messages written in code. And so Tandy - who had enlisted as a volunteer in the Royal Navy Reserves in 1939 - was sent to Bletchley, the centre of signals intelligence during the war. He was tasked with helping to crack the code of the German Naval Enigma machine. 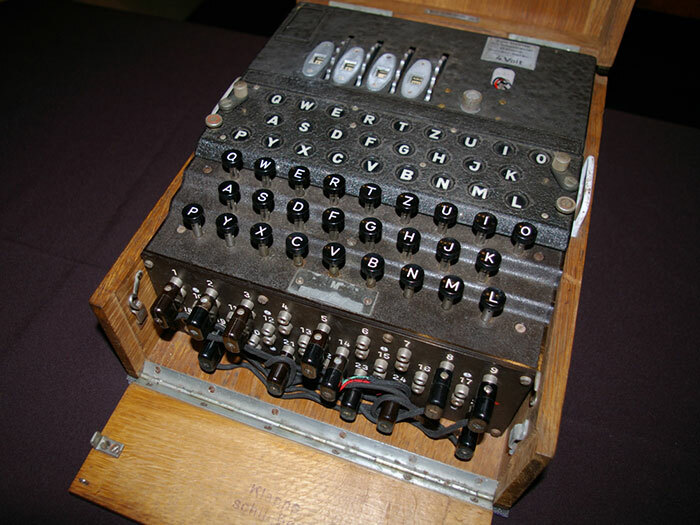 An Enigma machine, used by the Germans to send and receive encrypted military messages. Lieutenant-Commander Tandy (codenamed 'Six') did his best to learn the skills for which he'd been mistakenly hired, but while he was no Alan Turing, he did still play a significant role in the breaking of the Enigma cipher and in turn, the defeat of the Germans. You see, in 1941, a German U-boat was torpedoed and valuable items were salvaged by the allied forces. Among them were German procedural handbooks, navigational charts, and most vitally, bigram tables (or double-letter conversion tables). The bigrams were used by the Germans to unscramble the coded messages sent via the Enigma. But, alas, the paper on which the bigrams were printed was sodden and the Bletchley lot feared the secrets were beyond recovery. And that is where Geoffrey Tandy came to the rescue. With years of scientific experience preserving and preparing wet plant specimens, such as algae, as herbarium sheets, he knew exactly what to do to safely dry the precious paper. A call to the Museum elicited a supply of the tools Tandy needed, and he was able to save the paper and its cryptic clues from soggy obscurity. And that's how a seaweed scientist helped win the war. The cracking of the German Enigma machines at Bletchley Park is credited with considerably hastening the end of World War II. A specimen of marine algae, Kallymenia perforata, collected by Geoffrey Tandy. Preparing such specimens provided Tandy with the experience required to preserve wet documents captured from the Germans during World War II. 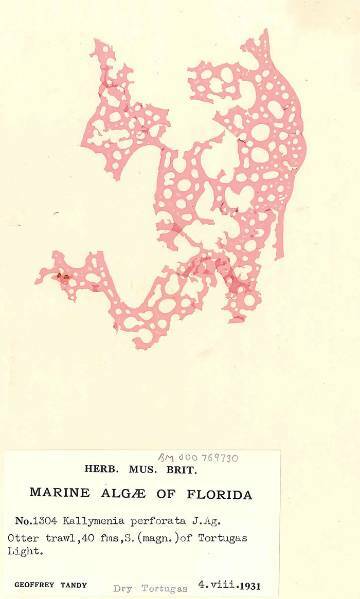 Specimen of the Month #12: all of them!